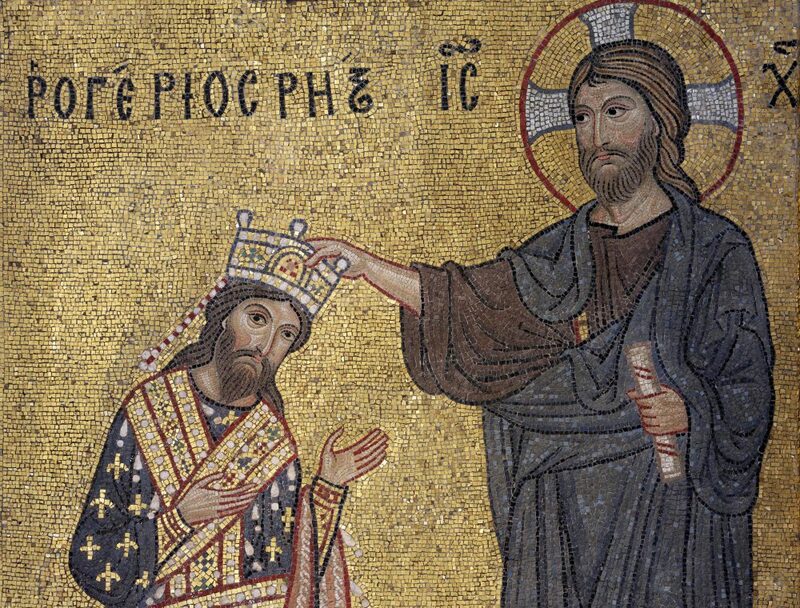 Roger II being crowned by Christ. Byzantine mosaic, La Martorana Church from the Norman period, Palermo, Sicily, Italy. In the ancient world, rulers usually staked their legitimacy by proclaiming their divinity. The Persian emperor Shapur I claimed on his coins to be “Divine Shapur King of Iran whose seed is from gods.” Julius Caesar had himself declared a god, and his heir Augustus claimed to be Divi filius, son of god. The Romans executed Jesus at least partly because they took his claim to be “son of god” as a challenge to their secular authority. Several rulers who posed as God’s chosen representative were simply catering to popular expectations. Frederick the Great of Prussia mocked Christianity when writing to the philosopher Voltaire (a vociferous critic of Christian dogma), but claimed divine sanction on his coins. Divine legitimacy requires some religious consensus. An impious king might lose his claim to the divine mandate and be overthrown. Religious minorities suffered persecution not only from religious intolerance, but also because defying the dominant faith meant defying the king. During the Reformation, both Catholics and Protestants declared that the faithful should rise up against a heretical king. One French tract from 1590 explicitly justified the assassination of unbelieving kings. Centuries of warfare resulted. But the violence and destructiveness of the Reformation’s religious wars eventually drove European thinkers to seek a basis for political legitimacy that rested on non-sectarian principles. Their efforts bore fruit in a new theory about political legitimacy: the social contract. The spread of social contract thinking, or the idea of the “national will,” does not automatically establish a truly democratic government. Instead, there is usually a long period of transition. The big idea of the social contract was that legitimacy really lay with something called “the people” or “the nation,” imagined to have a collective will. Contract theory derives legitimacy from parables about the rational self-interest of the people. Thomas Hobbes, one of the first social contract theorists, supported absolute monarchy as the only means of preventing a “war of all against all.” But by 1762, Jean-Jacques Rousseau described the collective will of the people as “the sovereign,” able to legitimately oppose, and supplant, the royal will. Rousseau treated the social contract itself as sacred, suggesting that it could form a simple “civil religion” to replace complex Christian theology. Social contract thinking inspired the American Revolution, the French Revolution, and other revolutions that have transformed most of the world. Yet the spread of social contract thinking, or the idea of the “national will,” does not automatically establish a truly democratic government. Instead, there is usually a long period of transition. Consider a few examples. In France, the great revolution of 1789 quickly descended into a period of bloody civil war and ideological persecution known as “the Reign of Terror.” Shortly after, Napoleon established a tyrannical dictatorship, tried to conquer neighboring countries, and was only stopped by a coalition of major European powers. Military defeat at Waterloo restored absolutist monarchy to France, but a further revolution in 1830 led to constitutional monarchy, and still another in 1848 led to another dictatorship. Only after military defeat in 1871 did a stable French republic emerge. The process took almost a century. Germany’s path to democracy was equally arduous. A popular revolution in 1848 decisively failed. Military defeat in the First World War led to another popular revolution, and in the interwar period, the democratic Weimar Republic survived some 14 years. Then Adolf Hitler established a murderous police state and set about conquering most of Europe. Only from the ashes of a chastened and defeated Germany did a stable German republic emerge, its new constitution engineered by the occupying Allied forces. Again, the process took about a century. But the Germans and French moved quickly compared to the British. The first English republic came into being in 1649, led by the dictatorial Oliver Cromwell, who launched aggressive wars against neighboring Ireland and Scotland. The Stuart dynasty returned to power in 1660, but the largely non-violent Glorious Revolution of 1688 established a constitutional monarchy. Democratic government did not emerge in practice until the 19th century, though the United Kingdom, as its name suggests, remains nominally monarchical. Perhaps this centuries-long timeline is the yardstick for setting our expectations today about the chances for democracy in the Arab world. In Egypt, hopes raised by the 2011 Arab Spring have been dashed. But skeptics of Arab democracy have forgotten how long and painful the path to democracy was in Europe. Throughout the Middle East, the slow progress of genuinely democratic government masks how rapidly democratic ideas are spreading. Indeed, even emirs and kings feel the need to go through the motions: Parliaments have been established in Oman, Qatar, Bahrain, Kuwait, Iran, and Saudi Arabia. These parliaments have limited powers, and are elected on limited franchises. Nevertheless, the line between ritualistic and genuinely democratic elections is hard to draw. Still, when compared to the absolutist monarchies of centuries past, even unfair elections and backsliding represent progress toward real democracy. Perhaps a long tradition of unfair elections will eventually create demand for fair elections. Slavery in the early American republic made a mockery of the famous boast from the declaration of independence that “all men are created equal.” Nevertheless, the empty boasts of 1776 have, perhaps, been gradually fulfilled over time. Alexander Maxwell is the author of two books on nationalism: Choosing Slovakia and Patriots Against Fashion. He works as senior lecturer in history at Victoria University in Wellington, New Zealand, where he directs the Antipodean East European Study Group.